Vincent Hickson is one of the names on the Bottesford ‘church list’ of WW1 Servicemen. Francis Vincent Hickson was born in Bottesford on the 5th November, 1892, and baptised on the 8th December that year at Bottesford, son of George William and Rebecca Anne Hickson. His father, George William Hickson, born in 1860, was a brother of the Easthorpe miller Arthur Hays Hickson (b.1853) whose son Bernard joined the Lincolnshires and tragically was killed by a shell fired from a U-Boat which attacked his ship, the troopship SS Mercian, off Gibraltar while en route for the Dardenelles in 1915. His mother was Rebecca Annie Hickson, neé Vincent, who was born in 1864 at Scarrington, Nottinghamshire, daughter of Francis and Caroline Vincent. In 1891 the Vincents lived at ‘Vincent’s House’ (The Elms) on Mill Lane (Belvoir Road) in Bottesford. Francis Vincent described himself as a retired farmer, as well he might in that he had been born in 1805 and was thus 86 years old. Caroline had been born in 1819. When Rebecca was born, her father was 59 and her mother 45. George William Hickson was a house guest of the Vincents on the night of the 1891 census. He and Rebecca were married in the summer of 1891. Francis Vincent Hickson was born in October, 1892, and his sister Marjorie in 1894. In 1901, Rebecca A Hickson lived at The Elms, ‘on her own means’, with her son Francis Vincent and daughter Marjorie. Also there were Mary Bragg, a 19 year old domestic servant from Scarrington, and a 21 year old cook named Mary Harrison who came from Cropwell Bishop. Kelly’s Directory for1908 lists Mrs Hickson, a private resident, at The Elms. It also lists Arthur Hays Hickson (Francis’s uncle and Bernard Hickson’s father), corn merchant & miller (water & steam), at Easthorpe mill, and Charles H. Hickson, a farmer, at Easthorpe Manor House. Kelly’s, 1912, again lists Arthur Hays Hickson as proprietor of Easthorpe Mill, and Francis’s brother Charles H. Hickson, farmer, at Easthorpe Manot. Kelly’s, 1916, once more records Mrs Hickson, a private resident, living at The Elms, in addition to Arthur Hays Hickson miller (water & Gas), and Charles Hickson, farmer, at the Manor House. There is a record of a Francis Vincent Hickson marrying Alicia A. Andrew at East Preston, Sussex, in the fourth quarter of 1915. By this time, he had been serving with the Royal Sussex Regiment for about a year. 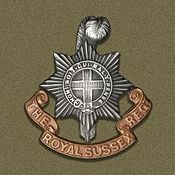 It appears most probable that he enlisted in late 1914 or early 1915, joining the 6th (Cyclists) Battalion of the Royal Sussex Regiment, and remained with this battalion throughout the war. The evidence is that he enlisted initially as a private soldier, and received his Commission later in 1915 after which he served as a junior NCO, reaching the rank of Captain by the end of the war. On the 9th June 1915, the London Gazette reported: “6th (Cyclist) Battalion, The Royal Sussex Regiment; Lance-Corporal Francis Vincent Hickson to be Second-Lieutenant. Dated 14th April 1915”. The Gazette later recorded that he was promoted from 2nd-Lieutentant to Acting Lieutenant on the 17th January, 1916, and that he was further promoted to Acting Captain, 6th Royal Sussex Regiment, on the 1st June 1916. According to the Long Long Trail website, the 6th (Cyclist) Battalion remained in Britain throughout the war from 1914, with bases at Brighton and in Norfolk, then from July 1916 at St Leonards, when they became part of the General Reserve. In 1918, they took up duties at Tralee and then at Limerick in Ireland. In the Absentee Voters list for Bottesford, Francis Vincent Hickson was recorded as due to come back to The Elms, serving as a Captain in the 1/6 Royal Sussex Cyclists. A Francis V. Hickson, married, born on the 5th November 1892, is found in the Register of 1939, living at 31 Lexham Gardens, Kensington, employed as a Travelling Land Agent for the War Office. He shared this address with twelve others, but his wife was not there. The other residents included another War Office Land Agent, Eric J Maitland, and his wife Vivienne. There were also a retired police superintendent (Metropolitan Police) and his wife, a consultant chemical engineer, an ‘editor and author’ and his wife, two office workers, three State Registered Nurses and a domestic servant. The house may have been divided into flats, and housed a selection of workers. In Francis’s case, it is possible that he used Lexham Gardens as a pied a terre while working away from home, but no information has been found about where his family or his home were at this time. Rebecca Hickson, the ‘Mrs Hickson listed by Kelly’s Directory from 1908 to 1916, is missing from Kelly’s 1928, suggesting that she had left Bottesford by this date, though Arthur Hays Hickson, miller (water & gas) was still there. Kelly’s 1932 again lists Arthur Hickson, miller, but nor Mrs Hickson of The Elms. A Rebecca Hickson, who may well have been Francis’s mother, died in 1939 at Cleethorpes, and there is also a record of a man called George Hickson, possibly his father, who died in 1943 at nearby Grimsby. There is a record from the London Gazette of the 2nd May, 1941: “General List. The undermentioned Capts to be Lts. (without Army pay and allcs). 18th December 1940”, and the following list included the name “Francis Vincent Hickson (175093)”. This seems to suggest that he rejoined the Army during WW2 on an unpaid basis, presumably for the purpose of continuing his work with the War Office helping to maintain their properties and installations. A man named Vincent Hickson died in October, 1955, at Blackpool, leaving “Mary Catherine” the sum of £722. She may have been Francis’s daughter or his second wife, but neither possibility has been confirmed. Moreover, apart from the marriage record from 1915, no information about his wife Alicia has been found. Francis Hickson’s father, George William Hickson, was not living with Rebecca, his wife, during either the 1901 census or the 1911 census. Searches for information about him at these dates or later have not been successful, apart from the record of the death at Grimsby in 1943 of a man with his name. George was born on the 14th May 1860, and baptised in Bottesford on the 22nd August of that year, son of William and Mary Ann Owen Hickson. In the 1871 census, the family were at the Watermill, Duke’s Wharf, Bottesford, where four children, one of whom was named George, born in 1851. It may well be that this date of `1851` is an error, and should have read 1861. The census records show that in 1871, George Hickson, born in 1861, from Bottesford, was a pupil lodging at 58 Spring Villas, Hatfield. It seems likely that he had been sent to a Prep-School either at Spring Villas or nearby (the census does not indicate that this address actually was the school itself). In the 1881 census, his father William Hickson, now recorded as a farmer rather than a miller, lived at Easthorpe Manor with his wife Mary Anne and their son Charles, born in 1962. Their eldest son, Arthur (born 1856 or 1853), had become the miller nearby at Easthorpe Mill, where he lived with his sister Emilia (b.1855) and brother Walter (b.1864). This may well have been the same mill as mentioned in 1871 as being at Duke’s Wharf. However, there is no evidence as to the whereabouts of George Hickson at this time. What we do know is that there is a court record that a man named George William Hickson was tried and convicted of assault on the 19th October, 1876, at Kingston-upon-Hull, though it is not clear what sentence he received. It appears he later returned to Bottesford. On the 5th January, 1889, the Grantham Journal names him as one of the mourners at the funeral of the rector, Reverend Canon Norman. This was two years before his marriage to Rebecca Vincent, three before the birth of his son Francis. George Hickson became a solicitor based in Bottesford, but in 1896 his affairs were ruined when he went bankrupt, was summoned for trial in Nottingham and absconded rather than appear in court. On the 8th February, 1896, the Grantham Journal carried an article entitled ‘The Affairs of a Bottesford Solicitor’, which described the scene at the Nottingham Bankruptcy Court in which he “did not respond when his name was called”. A further article by the Journal on the 25th April added that he had been struck off the rolls. The case was reported widely. As an example, the Bradford Daily Telegraph of the 22nd April, 1896, said that George Hickson had been “struck off the rolls for having borrowed £145 on a bill of exchange for £150, the signature to which he knew had been forged. There was no appearance on behalf of the correspondent”. There is also a report that on the 18th December, 1896, George Hickson was excluded from the De Vere Masonic Lodge for failing to pay his dues. This must have been viewed a scandalous state of affairs back in Bottesford. George seems to have fled, leaving Rebecca to raise their children. She went to live in the Elms, her parent’s old home, with an income ‘from private means’ probably derived from her parent’s estate. They did not divorce. Rebecca was referred to as Mrs George Hickson for many years, for example in a Journal report of the garden fete in 1902, and another of the wedding of Marjorie Hickson in February 1913 to John Frederick Dickie from Omagh, Co. Tyrone (at which the bride was given away by her brother, Francis Vincent Hickson). However, it is unclear how long Rebecca remained in Bottesford. Her death at Cleethorpes in 1939 suggests that she moved to NE Lincolnshire at some point in the 1930s and may have been reconciled to her husband George.